This is a collection of the apps I have written for OS X. This version uses new mxf font files with better quality fonts. It includes AcidCam, AlphaFlame HD, Quadtris, AtariVM, MAsterX-ovDM, MasterPiece / LostMasterPiece, Mutatris, QtMutatris, MutatrisHD, Ulimate MasterPiece, Super Stoner 420, and SuperMaster. Download current as of Feb 2013. 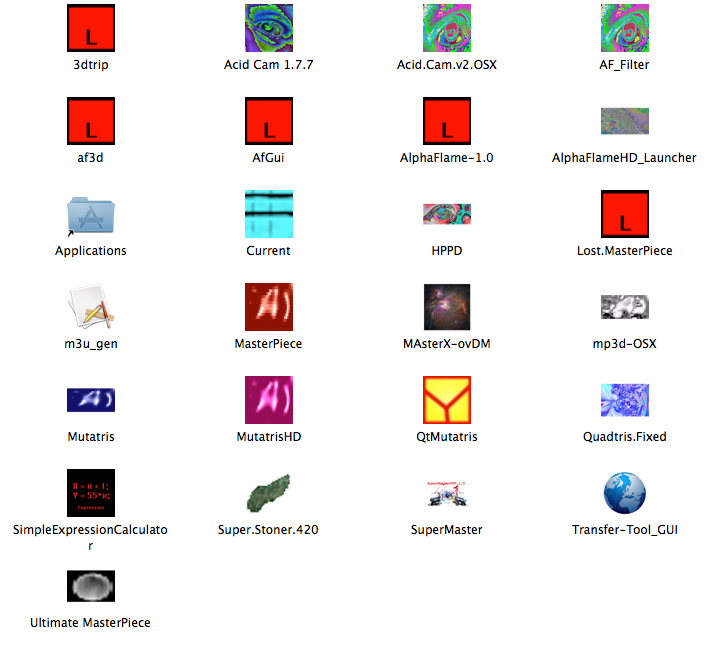 Note: you need to copy AlphaFlameHD_Launcher and MAsterX-ovDM to local directory like /Applications for them to work.